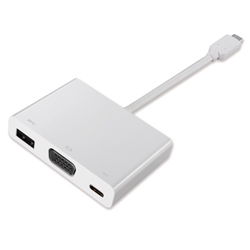 The USB-C to VGA Multiport Adapter Pro is designed for connecting a USB-C embedded device (laptop, desktop and etc.) that also supports ALT mode to a VGA embedded device (television, monitor and etc.). This adapter's output resolution is up to 1920x1200@60Hz. No need to install extra drivers, just plug and play. 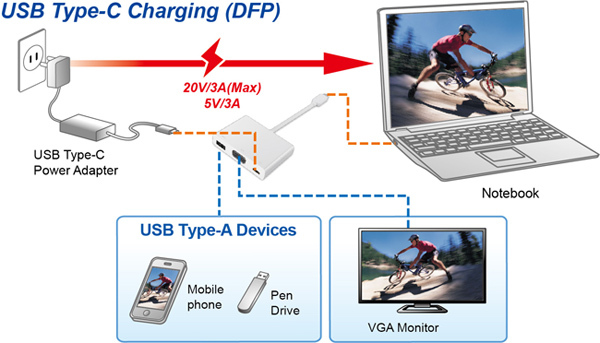 Feel free to charge your laptop by connecting the power adapter with the USB-C connector, and transmit the data via either the USB-C or USB 3.0 Type-A connector.